The radiation safety principle “as low as reasonably achievable” takes on an added dimension when the patient is a child. That’s the driving force behind the dose reduction program at The Children’s Hospital of Philadelphia (CHOP), where a multidisciplinary committee continues to tweak its protocols for CT and other modalities that deliver radioactive materials. CHOP began addressing dose reduction in 2004, six years before the FDA launched its radiation dose reduction initiative. Chris Tomlinson, MBA, CRA, senior director of radiology at CHOP, says the hospital’s efforts to increase safety for children undergoing radiation-releasing imaging began before the topic became headline news. CHOP also joined The Alliance for Radiation Safety in Pediatric Imaging’s Image Gently campaign. The campaign and its adult equivalent, Image Wisely, are grassroots efforts on the part of hospitals, imaging facilities, radiologists, and others involved in making imaging decisions to drive protocols that are “right sized” for children. 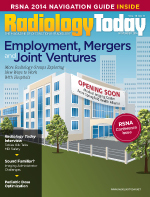 “This isn’t an industry initiative, but an effort on the part of practitioners to make sure the larger radiology community is right-sizing doses for children and not using protocols designed for adults,” Tomlinson says. Pulling together the team of practitioners to handle this evolutionary process is a key to the success of CHOP’s program and goes beyond the radiology department. A multidisciplinary group brings together C-level executives, risk managers, IT staff, referring physicians, radiologists, technologists, imaging administrators, and medical physicists—representatives from all modalities that utilize ionizing radiation. The approach goes beyond enhancing outcomes, Tomlinson says. Tomlinson says that any automated dose management solution must accommodate workflow and provide enterprisewide access and include all modalities. Regardless of the changes made, he says that all processes to reduce dose are developed in conjunction with the program and must detail workflows and risk management steps, as well as include patient communications. Procedures are reviewed and updated annually. According to Jaramillo, the program began “with baby steps” by reviewing CT scan protocols to see where they could reduce dose. Part of that protocol review process, then and continuing today, includes fine-tuning the right dose to optimize imaging. That right-sizing goes beyond age, as Patricia Mecca, CHOP’s lead technologist for CT, explains. She says they are regularly reviewing protocols and working with the radiologists to identify opportunities for dose optimization while maintaining image quality. The protocols can be optimized based on the diagnostics, says Xiaowei Zhu, MS, DABR, DABMP, the director of radiology physics and engineering at CHOP. “For example, in abdominal imaging we may modify imaging protocols based on whether this is an initial scan or a follow-up scan,” Zhu says. Implementing a dose reduction program hasn’t greatly impacted workflow at CHOP, Tomlinson says. He says program success comes from knowing the existing workflow and the role of all providers in the process and embracing decision-support systems. Calling on radiologist consultations on an “as-needed basis” allows ordering providers to have a physician-to-physician discussion around the correct study for the patient’s particular situation. Overall, new protocols are easily incorporated into the process, he says. “A lot of protocol changes take place in the background, so when the patient is brought in those steps are already taken care of,” Tomlinson says. Both Zhu and Mecca take part in laying the groundwork for fine-tuning protocols on phantoms, selecting the protocol before the patient is scanned. Tracking doses and protocols can go a long way toward helping facilities establish their own dose reduction programs. This can be done through a variety of methods; for example, Tomlinson sees benefits to using health care exchanges as a method of recording and reviewing data. This information sharing provides an opportunity to see what other institutions are doing to manage dose levels as well as track doses for a particular patient across health systems. In addition, the ACR operates the National Radiology Data Registry, a compilation of databases that compare imaging facilities according to type. One of those databases, the Dose Index Registry, allows facilities to compare their CT dose indices with regional and national numbers. Information related to dose indices for all CT exams is collected, anonymized, transmitted to the ACR, and stored in a database. Institutions are then provided with periodic feedback reports comparing their results by body part and exam type to aggregate results. While this is good in principle, Tomlinson says it may be underutilized. Another piece of information that is important to track, along with dose, is the number of imaging occurrences a patient experiences, Tomlinson says. Screening and diagnostic scans should be recorded in a dose passport guide that goes with the patient. In the case of CHOP’s younger patients, this means educating parents about radiation doses and how keeping track of their children’s imaging history can help direct their future care. “Radiation dose exposure has been sensationalized in the press so parents come to us fearful of what dose their children are receiving during a CT scan, for example,” Jaramillo says. Part of the education process involves helping parents understand the units of measure in radiology. That’s where technologists like Mecca get involved. When it comes to new technology, those involved in the CHOP program agree that an equipment and software purchase does guarantee a dose optimization program, particularly in light of this facility’s young patient population. Zhu says that while technology is helpful, it’s more about educating and properly training technologists and adapting protocols to fit the individual patients and the situation that is being diagnosed. It’s not just about “pushing a button,” she says. It takes teamwork, dedication, and patience. Elsewhere in the country, dose reduction programs are not taking hold at the same level as at CHOP, according to Shawn McKenzie, president and CEO of Ascendian Healthcare Consulting in Roseville, California. Even in California, which enacted dose reduction legislation in 2012 that, among other things, requires documentation of the dose of each CT exam, he does not foresee the implementation of such wide-reaching programs. Efforts are also under way in Texas, where the Department of State Health Services passed a number of dose regulations. McKenzie says that the lag in response to concerns regarding radiation doses could have its base in the health care financial situation today, with the industry in a “financial hangover” following the Affordable Care Act, cost-cutting initiatives, and the immense cost of implementing the electronic health record. He says most administrators are waiting to see what happens in the industry and even in their own facilities. Waiting for a worst-case scenario of overexposure isn’t a decision with best practices at its founding, McKenzie says. With proper data analysis in place, McKenzie says an organization can set dose levels based on the number of procedures a patient has undergone. Systems can be set to give alerts when patients may have reached the stage where they are approaching the thresholds set by the organization Those thresholds are even more of a concern at CHOP, he says, due to the younger patient base. Tomlinson looks forward to integrating dose reduction with best practices, to actually drive ordering and physicians’ behavior.